A new edition of Android Application Development All-in-One For Dummies (updated for the 21st century!) is available. Download the code for use with Android Studio! Read instructions on using Android Studio. Download the code for use with Eclipse! If you want to use Eclipse, visit eclipse.org and get Eclipse for Java Developers. After installing Eclipse for Java Developers, follow the instructions at http://developer.android.com/sdk/installing/installing-adt.html to add the ADT (Android Developer Tools) to Eclipse. Read instructions on adding the downloaded code to your Eclipse workspace. 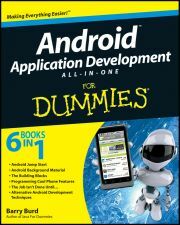 A new edition of Android Application Development All-in-One For Dummies (updated for the 21st century!) will be available in mid 2015. When you follow the instructions on downloading Java and Eclipse, you get Java software and Eclipse software on your computer. Your Java software's word length (32-bit or 64-bit) must match your Eclipse software's word length. In other words, 32-bit Eclipse runs with 32-bit Java, and 64-bit Eclipse runs with 64-bit Java. I haven't tried all possible combinations, but when I try to run 32-bit Eclipse with 64-bit Java, I see a misleading "No Java virtual machine was found" error message. If you're confused about the updates (and other changes) to Eclipse's Android Development Toolkit check this document. If you're interested in learning about the main activity's onCreateOptionsMenu method, check this document. On Page 275, there's an extraneous back-slash at the start of the XML code listing. 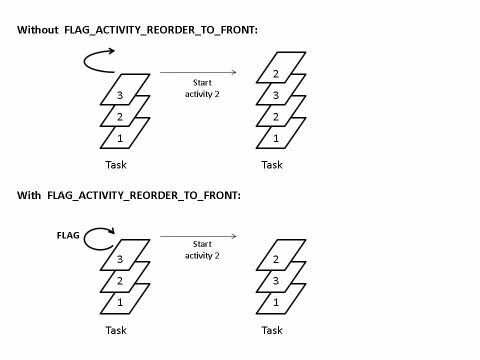 The first line of the listing should be <activity android:name=".OtherActivity">, and not \<activity android:name=".OtherActivity">. On Page 327 (in the printed version) Listing 3-13 is incorrectly labeled Listing 13-13. On Page 68, just before Listing 3-4, I refer to the listing as a main.xml file. In truth, the listing contains a strings.xml file. Thanks to Desmond Drummond for calling this to my attention. In Listing 4-1 (Chapter 4 of Book III), I misspell "MyReceiver" in a call to the Log.i method. As a result. Many output listings in the chapter display the misspelled word "MyRecevier." It doesn't harm the code, but it looks funny once you notice it. In fact, reader Joe Diviak noticed it and sent me an email about it. Thanks, Joe! Since the book's printing, Google's weather service has disappeared. So Listings 3-9 and 3-10 in Book III require some updating. In the revised versions of the listings, I query a different weather service: the World Weather Online service. Before you try to run the code, visit the World Weather Online Web site to get your own (free) usage key. (The MyWeatherService.java program doesn't work unless you add your own key to the code.) Jose A. Aponte-Lucena has contributed another weather app update which includes AIDL code.